In celebration of the 25th anniversary of the iconic comedy classic Wayne’s World, SpectiCast and Paramount Pictures are hosting an excellent, one-night-only theatrical event on February 8, 2017. Fans across the U.S. will have the chance to party on with Wayne and Garth when the film returns to more than 400 theaters. The special event will include an introduction by Peter Travers (Rolling Stone Magazine and ABC-TV) and a videotaped chat with the director and cast members after the film. Wayne’s World was originally released on February 14, 1992. 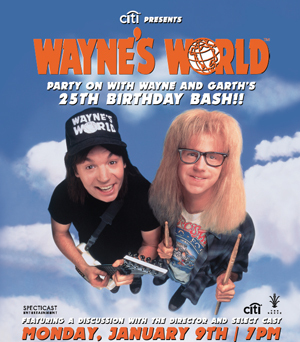 Join the director and cast members for a panel taping in honor of the 25th anniversary of Wayne’s World (WW25). The videotaped interviews will accompany the feature film when it returns to U.S. theaters for a one-night-only celebration in February. 7:00 PM: Original Pre-show Featurette, live talent conversation, additional on-screen conversation, followed by screening of full length Wayne's World Movie (1997) PG-13. Run Time: 1 hour 37 minutes. others TBC live, along with an on-screen presentation with Mike Myers, Dana Carvey, Lorne Michaels and Rob Lowe.